2 What do house finches eat? The house finch is one of the most common birds in the U.S. and comprises one of the widest ecological ranges of any bird. These finches are small-bodied with fairly large beaks and long flat heads. The males are easily recognizable with their bright coral red heads and breasts, with a flat brown back, underbelly, and tail. Female house finches have no red coloration at all and are more gray-brown all over. Both males and females have short wings, which can make their tails look long compared to the rest of their body. The red coloration in the house finch is actually due to the fruits and berries in their diets, meaning coloration can vary between birds. Some house finches are occasionally yellow and orange depending on locally available food. They are between 12 and 15 centimeters long and typically weigh just under an ounce. House finches tend to feed mostly on plant matter, with the majority of their diet consisting of seeds, buds, and fruit. They have also been known to feed on wild mustard seeds, knotweed, thistle, mulberry, poison oak, and cactus. In orchards, they can be somewhat of a nuisance, targeting cherries, apricots, peaches, pears, plums, strawberries, blackberries, and figs. However, most farmers do not consider them pests as they feed heavily on weeds and pests like dandelion, nettle, and aphids. 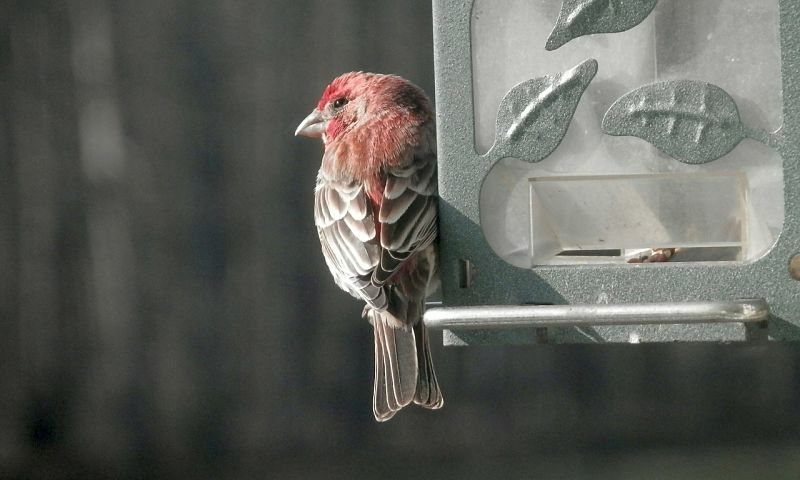 The house finch is a common feeder bird and prefers black oil sunflower seeds, nyjer seeds, and millet. They will feed directly at the feeder, on the ground, and nearby in groups on tree branches. They shell seeds with quick, repetitive bites, although they generally have very slow movements otherwise. They can also be very aggressive at feeders, dominating other species. These birds are also frequent visitors of parks, cities, farms, and the edges of forests. Like many other finch species, the house finch has a light, bouncy flight and tends to flock in large groups at the highest point in trees and power lines. House finch flocks have been known to be as large as several hundred birds, as they are a very social species not often seen alone. The house finch was originally native only to the Western U.S. and Mexico, preferring hot, dry deserts and the wide-open habitat of the southwest. However, in the 1940s a few house finches were released from a pet shop in New York City and quickly exploded in number. In the late 1800s, house finches were also introduced to the island of Oahu and by 1901 were abundant on all of the Hawaiian Islands. The house finch has since been naturalized, pushing out other species like the purple house finch and house sparrow. Scientists estimate that the house finch population now stands somewhere between 267 million and 1.4 billion individuals. However, in January 1994, the house finch nearly died out from an outbreak of the eye disease mycoplasmosis conjunctivitis, which caused respiratory problems and red, swollen eyes that made them particularly susceptible to predators and bad weather. Although the disease is not harmful to humans, it spread quickly across the U.S. and millions of these birds died, driving some smaller populations to near extinction. House finches typically do not migrate and remain in permanent territories year round. However, the most northern populations occasionally move south during exceptionally cold winters. They prefer edge forest ecosystems rather than dense stands of conifers and especially flourish in grassland, chaparral, and open woods. House finches have a cheerful, twittering call, with the males singing year round and the females only joining in during breeding season. You can listen to the sound of the house finch song here. Females are typically attracted to male house finches with the darkest red pigment. Males and females will participate in courtship displays in which the female lightly taps the beak of the male while fluttering her wings. The male responds by simulating regurgitating food multiple times before finally feeding her. House finches are typically monogamous and pairs form during the winter months with some pairs staying together year round. These birds are cavity nesters and create their nests in buildings, hanging plants, street lamps, ivy, and other cup shaped holes around six to nine feet off of the ground. They also nest in deciduous and coniferous trees as well as cactuses and rock ledges. Sometimes they will even use the abandoned nests of other birds. The female does all of the nest building and may put it together in as few as two days. Typically she will use twigs, leaves, string, wool, and other fine debris material to create a seven-inch wide, two-inch deep, cup-shaped nest that will hold between two and six eggs. The male feeds the female during incubation for two weeks and will feed the fledglings as they nest for the next 12 to 19 days. The house finch is one of only a few species that feeds its young plant matter alone, with dandelion seeds being the preferred diet. Cowbirds will sometimes lay their eggs in house finch nests, but the plant-only diet is not sufficient for young cowbirds and they often die. 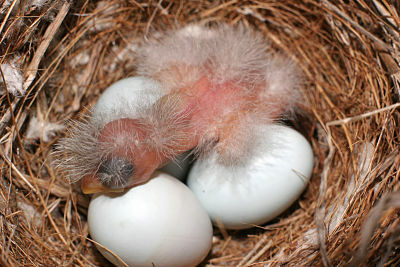 House finch young are born blind, helpless, and naked except for a few little patches of down. They are silent for the first week and only start peeping during feedings after that time. House finches can have anywhere between one and six broods in a season, typically laying between February and August. The females usually lay in the morning at a rate of one egg per day. Because mite infestation is more harmful to male chicks than females, the mother bird may lay eggs holding females first so that eggs containing males are not exposed as long to the mites. Scientists speculate that this increases the chances of both sexes surviving in equal numbers. House finch populations have been increasing for the last 50 years and scientists speculate a global breeding population of 45 million with 76 percent in the U.S., 21 percent in Mexico, and three percent in Canada. Hey Buddy!, I found this information for you: "The House Finch Bird". Here is the website link: http://backyardbirdingblog.com/house-finch-bird/. Thank you.